← Why do leopards climb trees? This is a nice photograph of the claws of a black panther (probably a melanistic leopard) and a human hand for comparison. To add some spice to the picture, the hand is in the leopard’s mouth! It tells us clearly the size of the claws of one of the big cats. If it is a leopard (alternatively the cat could be a jaguar which is slightly larger), you can imagine the sort of damage the claws could do. The jaguar and leopard are very similar and almost indistinguishable when their coats are black. Big cat claws and human hand contrast. Photo: The Black Jaguar-White Tiger™ Foundation. The hand belongs to the founder and owner of The Black Jaguar-White Tiger™ Foundation. His name is Eduardo Serio. The foundation is non-profit and was founded Aug 15th 2014. It rescues big cats and helps to change laws to better protect these animals. Eduardo Serio has an amazing relationship with the cats. They adore him. I don’t know the organisation. However, there is one comment on their FB page criticising it quite badly (see below) and Eduardo has not deleted it which indicates that he is honest but for me the bottom line is that the big cats are being exploited to a certain extent. They bring fame to this guy and it seems that he wants fame and to be admired. It is a kind of narcism. I may be overcritical but in an ideal world there would be no private big cats reserves/rescues like this one. The energies of humans should be focused on protecting and preserving the wild cats in situ, in their own habitat. We are positively not doing this anywhere near satisfactorily. I hate to harp on but The Black Jaguar-White Tiger™ Foundation is a symptom of our abject failure in big cat conservation on the planet. It is nothing to be proud of. I know it has to be commercialised to make money to achieve something but I don’t like to see it. It would be better if big cat rescues were tax payer funded I believe. These organisation commodify exotic cats. This entry was posted in leopard and tagged big cat rescue, black panther, Black Panther Pictures, cat claws, cat rescue by Michael Broad. Bookmark the permalink. Beautiful and a serious reminder of how powerful and dangerous wild cats are. They are not pets. 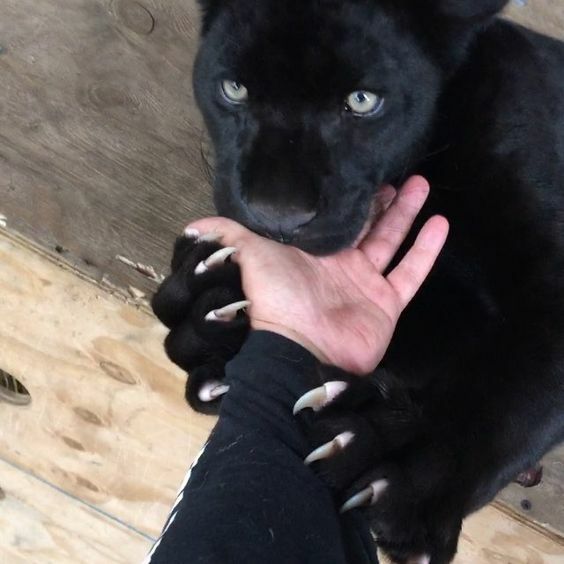 Definitely not, but it’s nice to see this black leopard with his claws intact instead of seeing those which have been mutilated by declawing. Beautiful animal.